G.I. 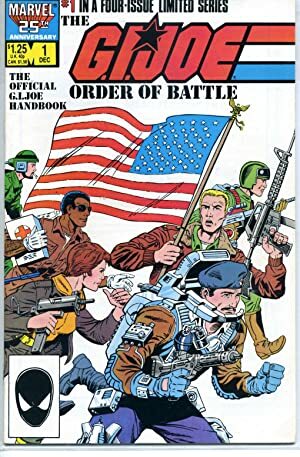 Joe: A Real American Hero was a comic book and cartoon series based off of Hasbro’s 1980’s military action figure toyline. While both series covered the same characters and concepts, they had vastly different continuities. The cartoon’s stories were far more fantastical (and often silly). The comic was far more realistic and gritty. Our write-ups specifically cover the first 56 issues of the 1982-1994 Marvel comics series which took place in its own universe. It thus exclude any events found in any other comics (IDW, Image, etc.) or television/movie series. 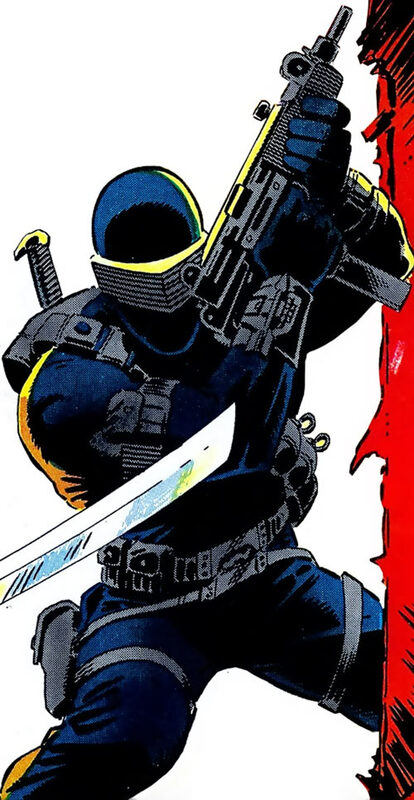 Snake-Eyes’ status as a ninja, distinctive uniform and mysterious background made easily made the most popular character of the franchise. This is interesting, as he was a minor character in the cartoon – since he couldn’t speak. 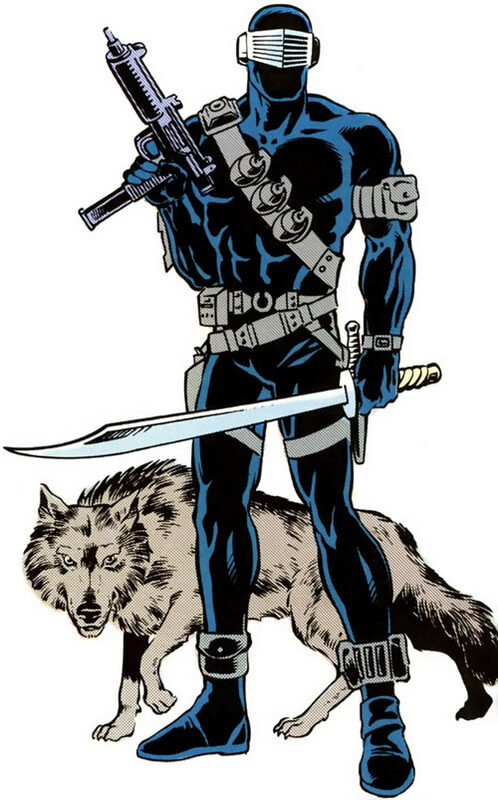 A tragic, masked, badass ninja with a machinegun and (occasionally) a pet wolf now seems over-the-top. But back in the 1980s it was the epitome of awesome, at least for little kids. Other Aliases: The “Silent” Master. Known Relatives: Unnamed Father (deceased), Unnamed Mother (deceased), Unnamed Twin Sister (deceased). Group Affiliation: G.I. Joe, U.S. Army. Base of Operations: “The Pit”: a remote area of Utah, formerly underneath Fort Wadsworth on Staten Island. Survival training (including jungle, desert and arctic survival). Snake-Eyes is a phenomenal hand to hand fighter. He currently holds black belts in 12 different martial arts (one of which is ninjitsu) and is highly proficient with any edged weapon. 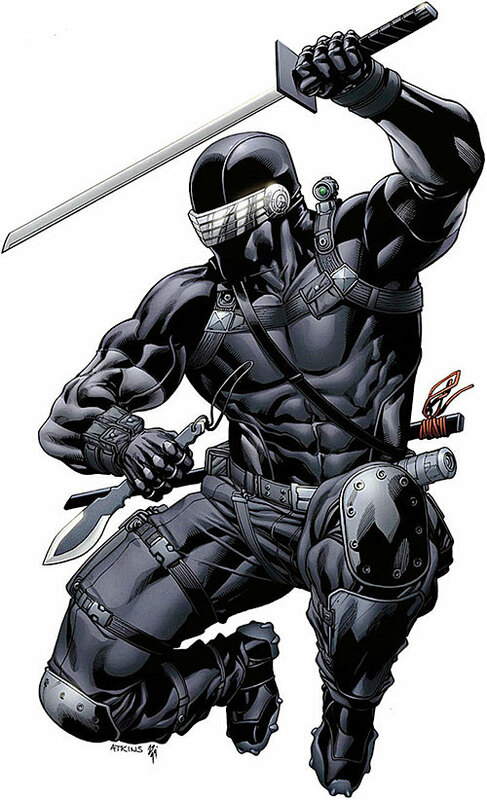 As a result of his training Snake-Eyes can scale sheer walls with his bare handed and move with blinding speed. Snake-Eyes is master of the Sleeping Phoenix Technique. When employed, this skill allows him to slow his vital functions to a level that resembles death itself. As a master of stealth and infiltration, Snake-Eyes rarely faces his foes directly. He will ambush his target(s) at every opportunity, removing them from the equation efficiently and silently when possible. At least one Marine Combat Knife. He sometimes arm himself with a sword that resembles a scimitar as well. 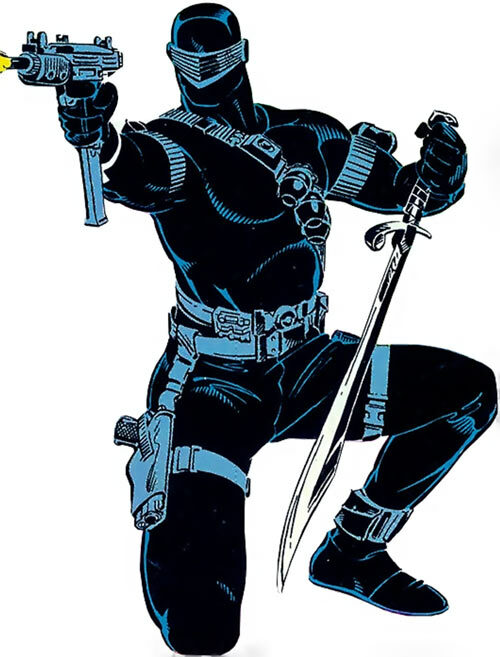 Snake-Eyes was brought up in a close-knit family during the 1960’s. He, and his twin sister, inherited a strong streak of idealism and patriotism from their parents. When America went to war in Việt Nam, he enlisted without hesitation. 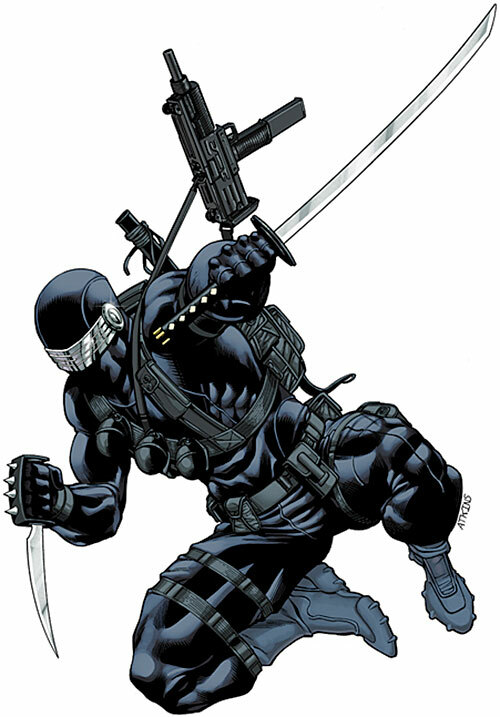 Snake-Eyes’ was assigned to a Long Range Recon Patrol on his first tour of duty. It was there where he first met and forged friendships with two men who would prove to be important parts of his life: Lonzo Wilkinson and Thomas Arashikage. Snake-Eyes and Tommy spent a lot of their downtime reminiscing about home. Snake-Eyes usually spoke about his sister, while Tommy spoke proudly of his family’s business in Japan. He often hinted that he could find Snake-Eyes a position in the business if he desired it. The unit saw many successes during the war until they were ambushed on a particularly nasty mission. Most of the group was killed during the ambush. Only Tommy, Lonzo and Snake-Eyes survived. The three men retreated toward an evacuation point but were unable to reach it before being attacked once more. Tommy and Lonzo managed to reach the helicopter intact. But Snake-Eyes was badly wounded and fell limply to the ground. Tommy went back, despite Lonzo’s direct order to leave him. He rescued his fallen friend without receiving a scratch. 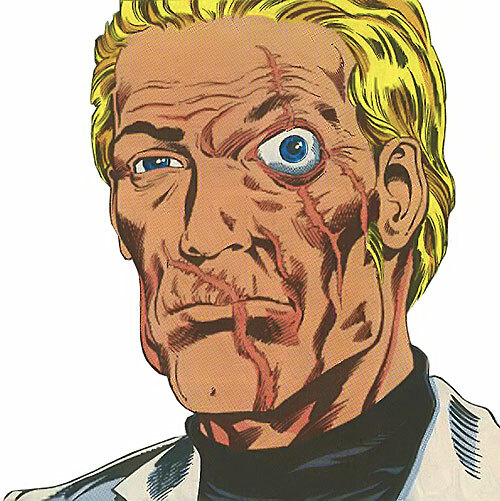 As a result of his wounds, Snake-Eyes was honourably discharged and sent home to recuperate. 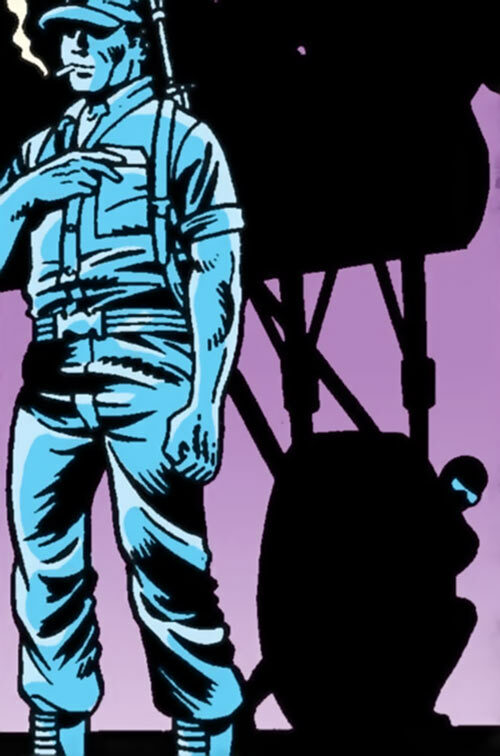 When his plane touched down, Snake-Eyes was approached by a young lieutenant. The lad informed him that his entire family had perished in a car accident on the way to pick him up from the airport. With nothing keeping him in the United States, Snake-Eyes soon found himself in Japan. He was working with Tommy in his family’s business. The one thing that Tommy left out was that his uncle was the master of the Arashikage ninja clan. For the next few years, Snake-Eyes was put through rigorous and relentless training in a dozen different forms of martial arts. He absorbed the information and techniques like a sponge, and over time grew even more skilled than his sword-brother, Tommy. Despite this, he remained humble and grateful. He often lost their practice duels to allow Tommy to save face. Snake-Eyes’ skill and attitude eventually won him the favour of the Tommy’s uncle, the “Hard Master”. The man began to groom Snake-Eyes as his heir. This caused friction between the two friends, but the clan’s masters encouraged them to settle it on their own. The Hard Master was murdered a short time later while imitating Snake-Eyes. He had been demonstrating a technique called “Donning the Chameleon’s Mantle” when he was shot with one of Tommy’s arrows. By the time anyone could react, Tommy had fled into the night. With the Hard Master’s death and Tommy’s disgrace, the Arashikage clan disbanded. Snake-Eyes returned to the United States bereft of purpose. He took up residence in the High Sierras. His solitude was eventually interrupted by a familiar face that he hadn’t seen in many years; Lonzo Wilkinson. Lonzo had tracked Snake-Eyes through his disability checks. He had come to recruit his comrade for an elite military strike force that was being assembled at the time. Having nothing better to do, Snake-Eyes accepted the offer. He became a founding member of the elite mobile strikeforce code named G.I. Joe. It was there that he first met Scarlett. When he first laid eyes on her, she was running a hand-to-hand combat refresher for the new recruits. When it was his turn to face her, he allowed Scarlett to defeat him. She realized it immediately, and knew that he had done so to allow her to keep her pride in front of the others. Instead of being insulted, she found herself intrigued by his humility. Later that night, Scarlett invited him to dinner where they became fast friends and talked of their past. Months later, while enroute to a mission, the two were involved in a helicopter crash. As the aircraft dropped from the sky, Scarlett’s harness got trapped in a door preventing her from escaping. Seeing her in danger, Snake-Eyes remained onboard and attempted to free her. Snake-Eyes fought through the pain. He managed to save Scarlett from the crash. He spent the next six months in a military hospital, where the surgeons attempted to fix his face and vocal chords. Unfortunately, at that time there was nothing they could do to make him look human ever again. Snake-Eyes could have easily retired from the military. But instead he chose to return to active duty. 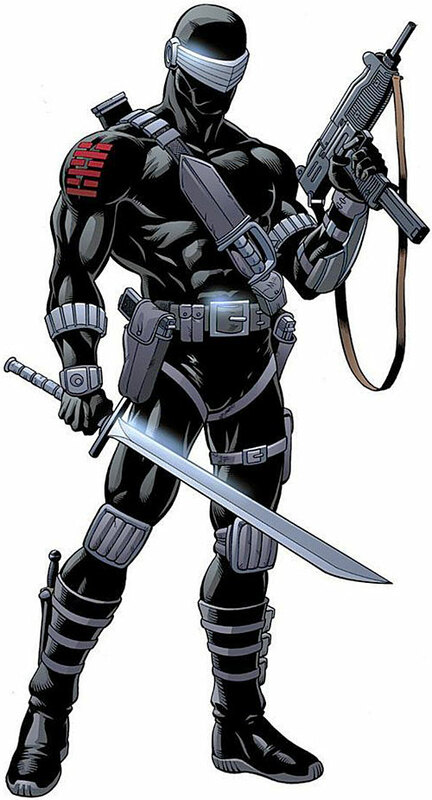 Upon his return, Snake-Eyes quickly cultivated a reputation of being the deadliest member of the G.I. Joe strike force. He was given the “impossible” tasks because he always succeeded and returned intact, in defiance of the odds. Over time, Snake-Eyes could not deny the feelings he had for Scarlett. The two became a couple. On several different occasions, Snake-Eyes broke mission protocol to rescue Scarlett from seemingly impossible situations. On one such occassion, he faced a Cobra agent of unusual skill who went by the name of Storm Shadow. While Snake-Eyes escaped the encounter with Scarlett and his life, something about the white garbed assassin was instantly familiar to him. Weeks later when one of the other Joes described the tattoo that Storm Shadow had on his forearm, Snake-Eyes realized Storm Shadow’s true identity. It was Tommy. Driven by a need for answers Snake-Eyes visited Storm Shadow’s last remaining uncle, the Soft Master. He hoped that the Master would know Tommy’s whereabouts. Fortunately for him, Storm Shadow had the same thought in mind and the two encountered each other at the Soft Master’s shop. Storm Shadow led Snake-Eyes on an extended chase across lower Manhattan, and the two eventually clashed on top of a subway car. Snake-Eyes had the opportunity to allow Storm Shadow to perish atop the car. But instead of doing so, he chose to spare Tommy’s life. Snake-Eyes mercy struck a chord in Tommy and he chose to end their feud on the spot. He then revealed to Snake-Eyes that he had not murdered the Hard Master. Rather it was an unknown assassin who had been hired to kill Snake-Eyes but mistakenly shot the Hard Master instead. Tommy had fled the dojo that night chasing the assassin and had been searching for him ever since. Desperate for answers, Tommy had agreed to work for Cobra in exchange for the identity of his uncle’s murderer. With that, the two came to an understanding and parted ways peacefully. 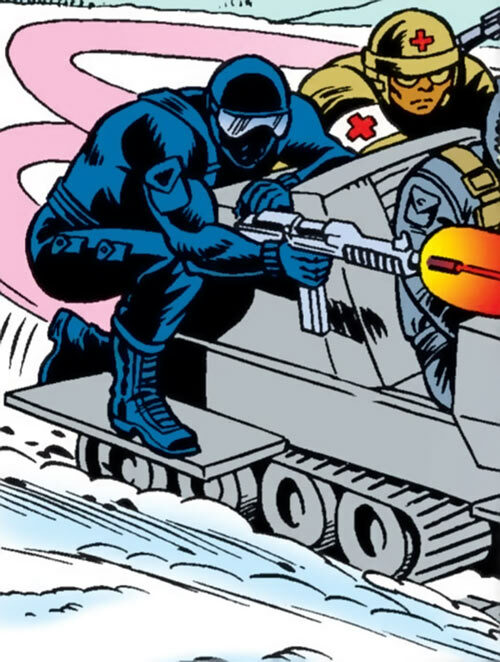 Over the next few months, Snake-Eyes continued to go into battle next to his fellow soldiers on the “Joe” team. He fended off personal attacks from Cobra several times. One such attack resulted in the destruction of his Sierras cabin, but as always Snake-Eyes managed to survive. Many eventful months past for Snake-Eyes. He eventually received a message from the Soft Master that revealed the true identity of the Hard Master’s killer. Zartan, Master of Disguise, had perpetrated the crime on Cobra’s behalf all those years ago. With this knowledge in hand, Snake-Eyes recruited Storm Shadow for an assassination mission. It would lead them to the shores of Cobra Island. The two ninja infiltrated the Cobra stronghold and cut a bloody swathe through any and everyone who got in their way. Dozens of men died at the feet of the two berserk assassins before they managed to reach Zartan. In truth, they very nearly succeeded in murdering him but he escaped their wrath disguised as Ripcord, a fallen member of the Joe team. Disappointment and frustration boiled within the two as they fought their way back to the beach in an attempt to escape. Tragedy struck when Storm Shadow was shot multiple times when they arrived there. Snake-Eyes was forced to leave Tommy’s dead body on the beach as he made his escape. Or so he thought; weeks later Storm Shadow infiltrated G.I. Joe headquarters. He revealed to Snake-Eyes that he had used the Sleeping Phoenix technique to slow his vitals to the point of death immediately after being wounded. He went on to say that his wounds had been so grievous that he had hovered between life and death for what felt like an eternity. He was revived in the very same experiment that had created the new Cobra Emperor, Serpentor. The experience had left him a mental wreck. He broke down while retelling the story. 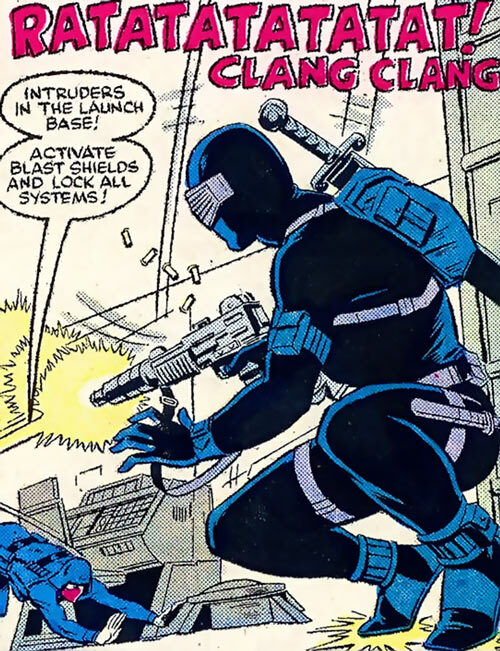 Realizing that Storm Shadow had no place else to go, Snake-Eyes gave him the key to what was left of his cabin. Storm Shadow recognized the gesture for what it was. In that moment decided to abandon his quest for vengeance and left for the High Sierras in the hopes of sorting out his “second” life. When the Joes needed to gather intel regarding the new Cobra mobile command centers, Snake-Eyes (in the guise of his fellow Joe Flint) allowed himself to be taken captive in Sierra Gordo. The plan was that he could easily escape any form of security that Cobra employed and return with some much needed intel. He did escape the clutches of his captors. 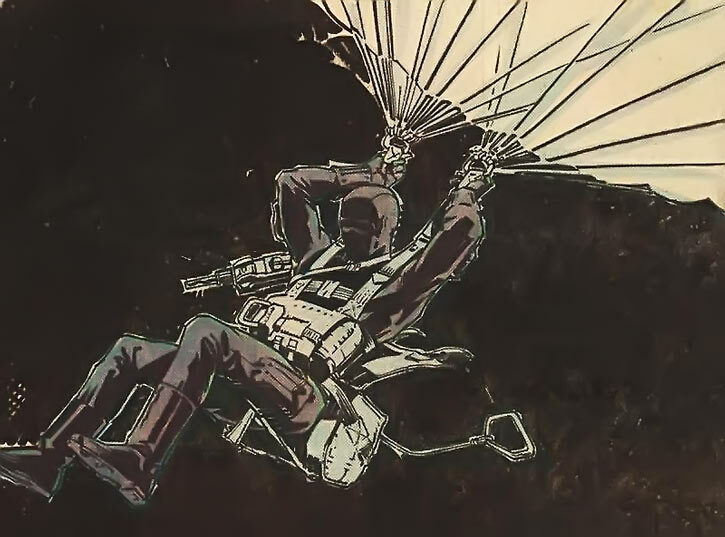 But he was forced to allow himself to be recaptured in order to allow his extraction team (including his old friend Stalker) to escape certain death. After being rendered unconscious, he was quickly bundled onto a helicopter and flown to the Cobra Consulate Building in New York City. He was held captive there and interrogated for what seemed like days. He eventually mustered enough strength to free himself from his captivity. Howbeit, he was overwhelmed by a squad of Cobra Officers mere seconds after his escape. 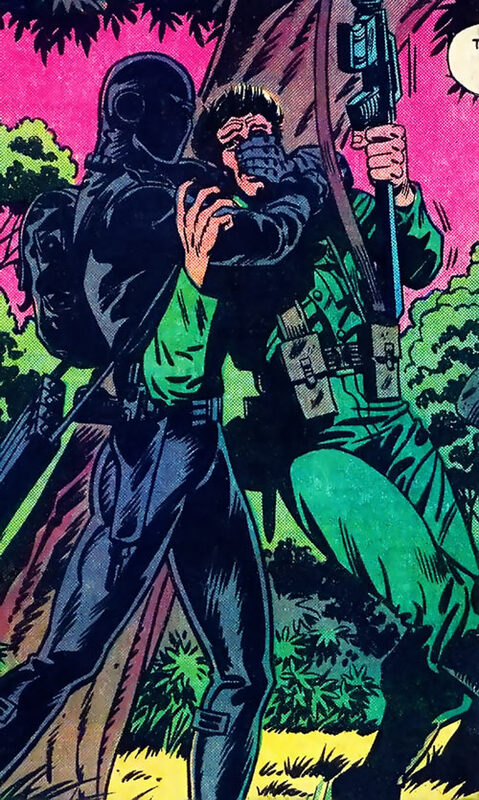 It was only the timely arrival of Scarlett and Storm Shadow, whom Scarlett had recruited from his self-imposed exile, that saved his life and ultimately freed him from his captivity. 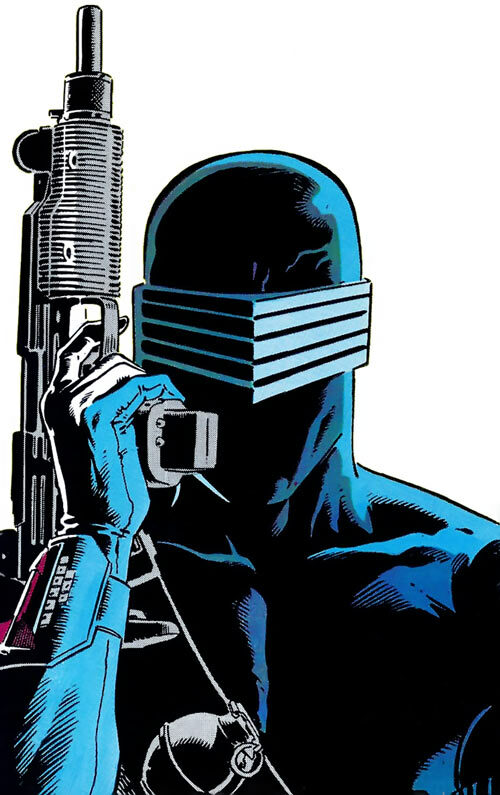 Snake-Eyes is of average height and has a swimmer’s build. He has medium length blond hair and piercing blue eyes. His face is a hideous mass of scars. His cheeks are sunken in, and he has several long, deep, keloid scars running diagonally from the right side of his face to the left. His left eye is constantly exposed as its eyelid had been all but destroyed. 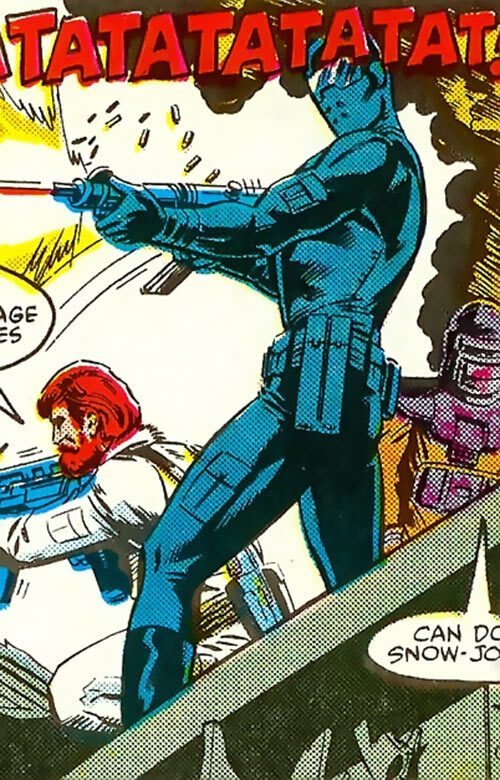 Snake-Eyes’ combat uniform is normally made up of some form of black body suit. While the suit wasn’t necessarily made up of spandex, it was virtually skin tight and covered Snake-Eyes from neck to toe. He topped the suit off with a pair of black gloves and sturdy black boots. His uniform is always accessorized with a variety of holsters, clips, knives, swords, pockets and guns. At this point in time, Snake-Eyes is rarely seen without some form of mask on his face. If he is out in public and wants to blend in, he will wear a well-crafted rubber mask that resembles his original features. Otherwise, Snake-Eyes wears a tight black mask that completely conceals his features. The only holes it has are for the wearers eyes, which Snake-Eyes always conceals with a thin pair of goggles. 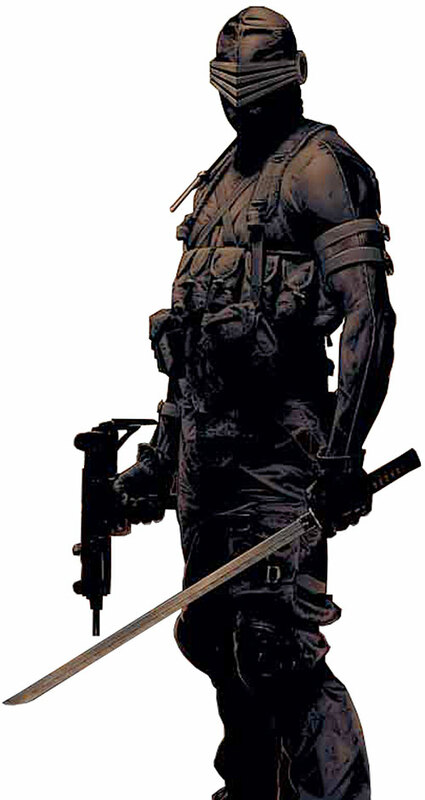 Lastly, Snake-Eyes has a tattoo on his right forearm, which is the symbol of the Arashikage clan. The tattoo is made up of three red broken lines interlaced with three red unbroken lines of the same length. Snake-Eyes is a deeply damaged man; a fact that he is quite aware of. Though he projects an air of stoicism, this could be nothing farther than the truth. In reality, he is a man that has learned to embrace his pain and tries to prevent it from controlling him. At one point, Snake-Eyes craved nothing more that complete isolation from the world’s stimuli. When he couldn’t retreat to his home in the Sierras’, he would spend up to eight hours a day in a sensory deprivation tank. He tends to keep to himself. Any conversation he may have is laconic at best (only a few of this allies actually understand sign-language) and tends to be mission based. He is greatly sensitive about his scarred visage. At one point, he pointed a fully loaded gun at Doc when he attempted to remove his mask. He desperately wishes he could feel the sun on his naked face and walk the streets, simply holding Scarlett’s hand without drawing stares from horrified onlookers. Despite the amount of time that has passed, he still worries that Scarlett is with him out of pity. This isn’t to say that Snake-Eyes is always depressed and dour. While he can be quiet and serious he still has a sense of humor. He often laughs silently to himself while observing the antics of his teammates. Ultimately, Snake-Eyes is a soldier at heart. So much so, that he doesn’t know how to be anything else. He is exceptionally patriotic, loyal and driven by a keen sense of honour and duty. He always chooses the direct route to solving issues and will complete his mission at all costs, even personal ones. 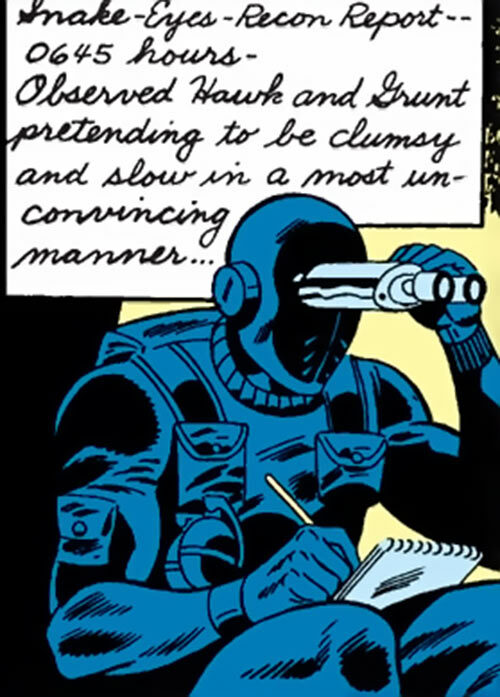 Snake-Eyes has demonstrated a tendency to go “off-book” upon the completion of a mission or in downtimes. He will often put himself in great danger to rescue an ally (especially Scarlett whom he loves dearly), or to gain vengeance for them. This last point can be one of particular concern for any that draw his ire. To say that Snake-Eyes has an unconventional desire for vengeance would be an understatement. If he perceives that he or one of his have been wronged, he will pursue the perpetrator to the ends of the earth to balance the scales. To make matters worse, he has demonstrated in the past that he is capable of mass murder in order to achieve said goal. Snake-Eyes, and every other members of G.I. Joe can be inserted wholesale into the DC Universe without changing their origins. Instead of dealing with a criminal organization named Cobra, it would be simple for them to be combating Kobra’s vast terrorist organization. 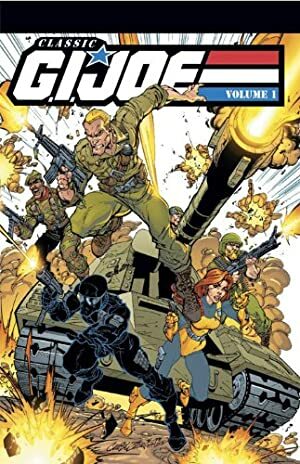 GI Joe could be an extension of SHIELD or even the Super-Soldier program (especially Snake-Eyes). It could be a mind shift or competing program. If they can’t make a “Super-Soldier” through engineering the soldier himself, they could take the best of the best and give them the best training and equipment and create a sort of “Super Unit”, like Skul‘s. Ultra-vision is Night Vision Only (-1). Running has been added for Pushes. Expertise (Martial Arts Lore, Military Equipment and Protocols, Mountaineering, Parachuting, SCUBA, Wilderness Survival), Language (Japanese, Sign Language), Schtick (Quick draw), Pet (Timber the wolf), Rank (Sergeant), Sharp Eye. G.I. Joe (High), Scarlett (High), Storm Shadow (High), US Armed Forces (Low). Creepy Appearance (Scarred Face), SIA to Vengeance, SPR (Mute), Secret Identity. Combat Knive (x2) [BODY 10, EV 03 (05 w/STR, 10 w/Martial Artist), R#0]. Sword [BODY 10, EV 04 (08 w/Martial Artist), R#0]. Submachinegun (Uzi 9mm) [BODY 04, Projectile weapons: 05, Ammo: 07, R#02, Advantage : Autofire]. Helper(s): Adam Fuqua, Eric Langendorff, Roy Cowan, Sébastien Andrivet, Firebomb . Writeup completed on the 16th of April, 2016.